This article examines the relationship between ethnicity and nationality in forming the national identity of the Russian people, emphasizing the danger of relying on the “ethnic” model of the nation developed in Soviet social science. Analyzing the fundamental documents of the Soviet State from the 1917 Declaration of the Rights of Peoples of Russia to the last Soviet Constitution of 1977, the author points out: (1) the significant contradiction between the proclaimed right of nations to self-determination and the principle of territorial integrity and, (2) evidence that a national policy based on the ethnic nationalist model created a peculiar “hierarchy of peoples” (so-called “titular” and “not-titular” nationalities). The challenges to the Soviet Union’s national policy that took place during the 1990th and its consequences – the disappearance of the Soviet Union from the world map and subsequent movements toward breaking apart the Russian Federation (the sovereignty claims of Chechnya and some of the Volga republics) – indicate that the tasks of a multi-ethnic state, such as solving national problems and harmonizing interethnic relations, require rejecting the ideology of ethnic nationalism, and moving toward the “de-ethnicisation” of nationality and the formation of a unified civil nation. Understanding that the transition to the paradigm of Russian national identity derived from civic nationhood is a complex and lengthy process, the author develops a multi-level model of the formation of Russian national identity comprised of (1) the basic level of cultural diversity, (2) the middle level of solidarity in the overcoming of cultural differences on the basis of an awareness of “shared values,” and (3) the highest level of civic consciousness – the awareness of being a citizen of Russia and an understanding of the civic responsibilities this entails. Finally, the author translation of the article. 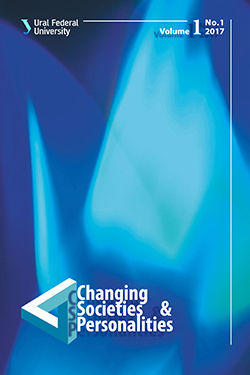 outlines the role the social sciences play in the process of the formation of the national identity, pointing out the need to establish the theoretical basics of national policy, and to develop models for its implementation. Nikolai Skvortsov is Professor of Sociology, Head of Department of Comparative Sociology, Dean of the Faculty of Sociology, and Vice-Rector for Research at St. Petersburg State University. He is also Russian Director of the Center for German and European Studies (St. Petersburg State University – University of Bielefeld). His principle research interests are ethnic studies, social and cultural anthropology, intercultural communication. Kortunov, S. V. (2009). Nacional'naja identichnost': postizhenie smysla [National Identity: comprehension of the meaning]. Moscow: Aspekt-Press. Stalin, I. V. (1946). Marksizm i nacional'nyj vopros (Soch. T.2) [Marxism and the National Question (Works. Volume 2)]. Moscow: Politizdat. Bromley, Ju.V. (1987). Jetnosocial'nye processy: teorija, istorija, sovremennost' [Ethnosocial processes: Theory, History, Modernity]. Moscow: Nauka. Tugendhat, Je. (2001). Partikuljarizm i universalizm (Per. s nem.) [Particularism and universalism (Transl. from German)]. Logos, 4, 41–47. Serio, P. (1995). Jetnos i demos: diskursivnoe postroenie kollektivnoj identichnosti (Per. s frants.). V V. Dressler-Holohan, N.G. Skvorcov (Nauchnye red. ), Jetnichnost'. Nacional'nye dvizhenija. Social'naja praktika (S. 51–59) [Ethnicity and demos: discursive construction of collective identity (Transl. from French). In W. Dressler-Holohan, N. Skvortsov (Ed. ), Ethnicity. National movements. Social practice (pp. 51–59)]. St. Petersburg: Petropolis. Sovetskij jenciklopedicheskij slovar' (Izd. 4-e.). (1987). [The Soviet Encyclopedic Dictionary (4th ed.)]. Moscow: Sovetskaja jenciklopedija.